YellowAirplane.com: F-4 Phantom missiles Pictures. Look at the incedible detail in this model. This is from a combination of the fine models from Tamiya and the skillful hand of Inaki. 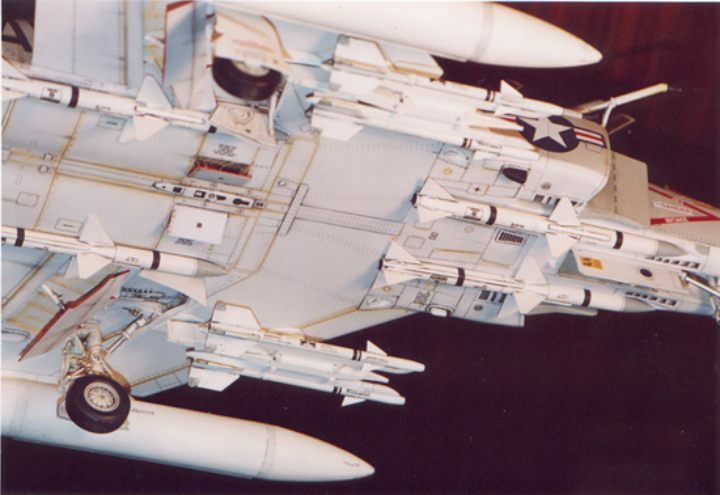 The detail of the bottom of this F4 and the missiles looks absolutely real. This Plane is from Tamiya at 1/32 scale. It has die-cast metal landing gear struts. Wingspan 368mm and fusselage 555mm. There were two more versions : from VF-96 "Fighting Falncons" ( VietNam´s Ace Ralph Cunningan´s bird) and VMFA-451 "Warlords". It has no bombs, only Sparrows and Sidewinders. Would you like to take a trip to the North Pole?